It was a sad day in modern music and for guitarists in particular when we learned of the death of legendary British guitarist Allan Holdsworth on April 15th, 2017. I first became aware of the awesome talents and music of Mr. Holdsworth in the mid 1970's. My small group of friends and I were aspiring guitarists and were heavy vinyl record collectors. As our tastes matured we gravitated towards Progressive Rock and then onto Jazz and all its variants. Allan Holdsworth was right there at the nexus of Rock, Fusion, and Jazz. For most guitarists and even other so called guitar Gods, Allan's sound and approach to playing the guitar was just plain confounding and bordering on incomprehensible for mere mortal musicians. Ironically, Allan never seemed to be satisfied with his playing or albums and always claimed it was sub-par. I think this played a role in his untimely death as he seemed to have an unending series of bad breaks that left him apparently impoverished at the time of his death. In a just world, he would have been showered with riches that his talent deserved. I was lucky to hear Allan play many times throughout his career. One particular encounter remains lodged in my brain. In the summer of 1982, I embarked on a grand tour of the European continent. I had just finished my junior year of college at Syracuse University, and like so many before me obtained my Eurail Pass, shouldered my backpack, and took off for an adventurous summer. Being a huge music fan and erstwhile guitarist, I planned much of my travels around the numerous music festivals that take place every summer. I first landed in England, the place of my birth, and stayed with family friends. Eventually, I made my way to France via Ireland and then spent a couple of weeks in Paris visiting museums by day and attending Jazz clubs by night. It then became time to travel to The Hague in Holland for the famous North Sea Jazz festival. Highlights of the 1982 schedule that I saw included Sun Ra and his Arkestra, the John Scofield Trio, and the Carla Bley big band. From the North Sea, I worked my way south to Switzerland for the famous Montreux Jazz Festival. Through a connection with a friend at home, I had hoped to actually work at the Festival as an usher or something but that failed to materialize. Even so, just enjoying the beauty of Lac Léman in the Summer was wonderful. Of course, musicians were everywhere. I remember running into a young Wynton Marsalis on the Promenade and having a brief chat. Wynton and his band had just played in Syracuse earlier that year promoting his debut CBS recording. I had another brief encounter with David Sancious as he was enjoying a beverage at an outdoor cafe. As I studied the concert schedule, I zeroed in on one particular concert as a must attend. It was rightly billed as a Super Group under the billing of famed drummer Billy Cobham. The assembled musicians included David Sancious (keyboards), Didier Lockwood (violin), Jack Bruce (bass), and Allan Holdsworth (guitar). I made a beeline to the ticket office and obtained my precious seat for the event. Being a student and traveling on a budget, I took advantage of many youth hostels for my lodging. I believe this is where I made acquaintance with other fellow jazz fans. At some point, I became friendly with someone claiming to be a Yugoslavian Jazz journalist. I only spoke English and a smattering of high school French. My new Yugo Jazz friend spoke quite good English so we stuck to that. He then told me that he had arranged for an interview with none other than the great English guitarist Allan Holdsworth! Quite unexpectedly and bizarrely he then asked if I would accompany him to the interview to help translate even though it was clear I did not speak a speck of Yugoslavian! Not being one to let small details get in the way, I quickly agreed to his invitation. At the appointed time, we made our way to Allan's hotel room. My recollection given that has been some 35 years ago, is of Allan sitting on the bed with his Gibson SG guitar plugged into something like a JHS Rock Box portable headphone guitar practice device. My remembrance is he was furiously practicing the music for that evening's show. It is my understanding that Allan did not read music which I believe put more pressure on Allan to learn the music quickly for the show. I may also remember a certain nervousness coming from Allan. His wife, Claire, was quietly sitting in a corner while my new Jazz journo friend proceeded with the interview. Claire never said a word during the entire time with the exception of a possible hello and goodbye. Unfortunately, my memory fails me as to what was actually discussed. I am sure the usual questions that musicians are endlessly asked and become bored by. I don't recollect at all what my contribution was beyond sitting there wide eyed and slack jawed and mumbling how much of a fan I was of his music. As quickly as it had begun, the interview was concluded and we left Allan and his wife in peace. The concert that night was amazing for it's assemblage of musicians but was probably not Allan's best performance. I remember specifically that Allan had problems with his amplifier rig at the beginning of the concert which impacted his performance. 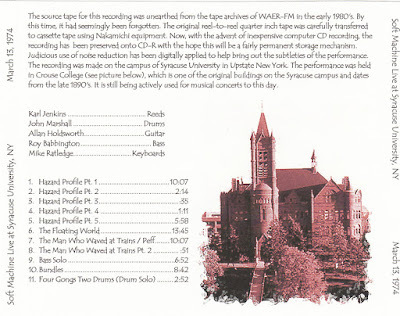 Amazingly, some twenty five years later, a recording of this exact performance appeared on the fan download site Dimeadozen.org. Apparently, the concert was broadcast on FM Radio. The download is titled "A Gathering of Minds, Casino De Montreux, 23 July 1982". The setlist includes: Crazy Eights, Mysterious Conversation, Ursula In Summer, Drifting Into The Attack, Theme From An Imaginary Western, Uptown Breakdown, Sleight Of Hand, Bloody Mary, and Improvisation in B Flat. So, decades later I had an audio souvenir of my time with Allan Holdsworth! My understanding was that this group was scheduled to go into the studio to record an album but sadly this never came to pass so all we have at least is this radio broadcast to document the event. As a postscript, upon returning to Syracuse University I resumed my education and activities for my Senior year. I had been active as a music DJ on the then totally student run 50kw FM radio station WAER. I spent a lot of time ploughing through the record and tape stacks of the station and eventually uncovered a forgotten live radio broadcast labeled Soft Machine at Crouse College, March 13, 1974! I nearly passed out. 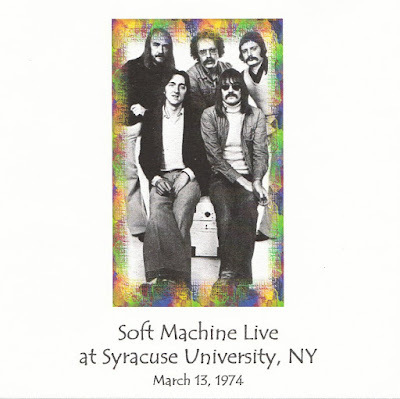 When I got to play it on the reel-to-reel tape machine, I was overjoyed to hear that was in fact Bundle's era Soft Machine featuring Allan Holdsworth. During a school break back at home in Maryland, I borrowed my friend Steve's (Owner Cuneiform Records) Teac reel-to-reel and made copies of the tape on my Nakamichi 600 cassette deck. I have been an audiophile all my life so I tried to use the best equipment I had access to at the time. I made several copies and of course gave a copy to Steve to thank him for lending me his tape deck. I believe Steve once considered the possibility of publishing this recording on his Cuneiform label but maybe never did because of copyright issues? He was later able to obtain the rights to produce another concert of this era. I have since uploaded my original copy of the recording to Dimeadozen.org to replace inferior copies that were being circulated. I returned the original reel-to-reel tape to the WAER library. I now regret doing this since I am sure the original tape was discarded at some point. But, at least I have a fairly high quality copy. So ends my reminiscence of my encounter with one of Music's greatest icons. My wish is that his music will live on and more people will become exposed and come to admire, if not worship, Allan Holdsworth's great contributions to the world.